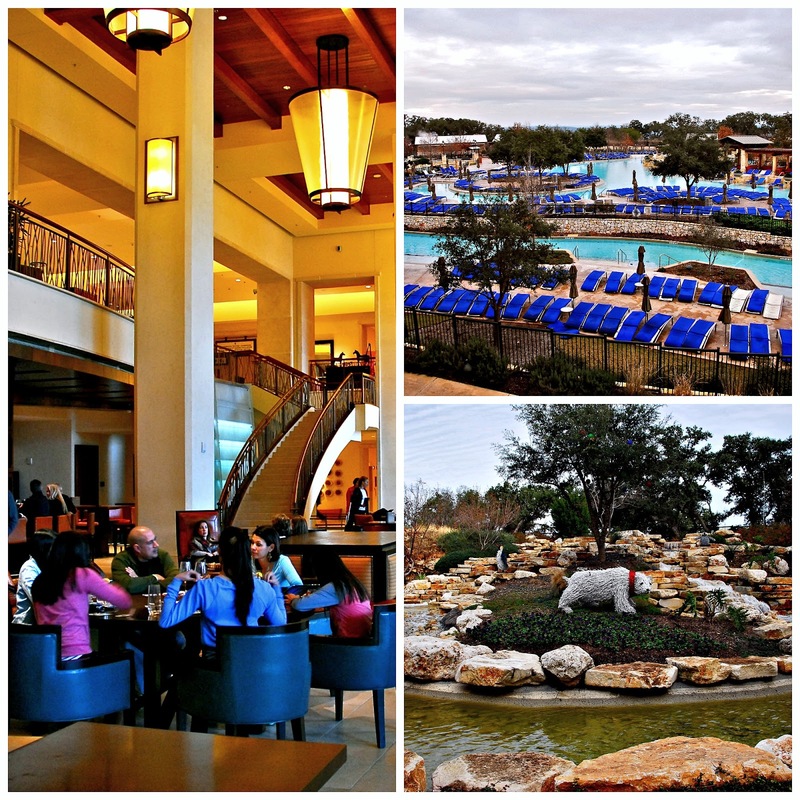 Michael and I recently enjoyed a fun staycation getaway right here in San Antonio. 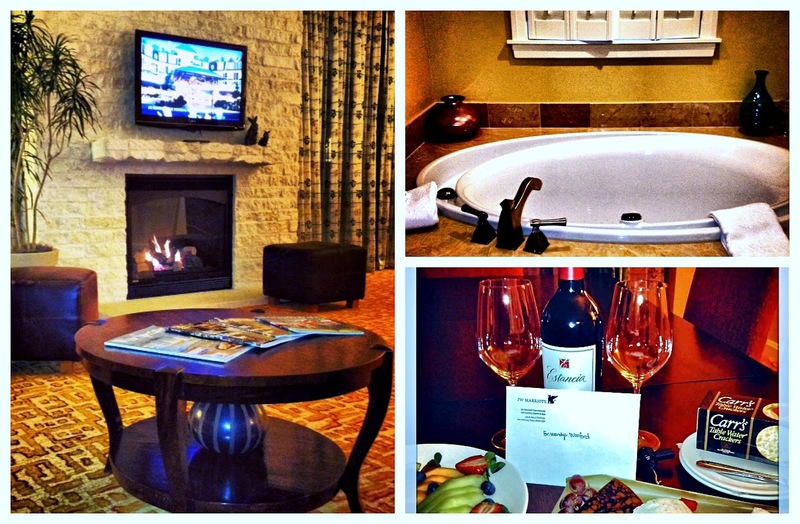 We were invited for a sweet suite getaway at the AAA 4 Diamond JW Marriott San Antonio Hill Country Resort & Spa. Our overnight trip also featured a delicious Mexican dinner at La Hacienda de los Barios, gourmet Sunday Brunch at the Marriott's 18 Oaks, and even a sneak peak at a game in the resort's High Velocity sport bar! It was a fabulous getaway that didn't require plane fare...or even a long drive! 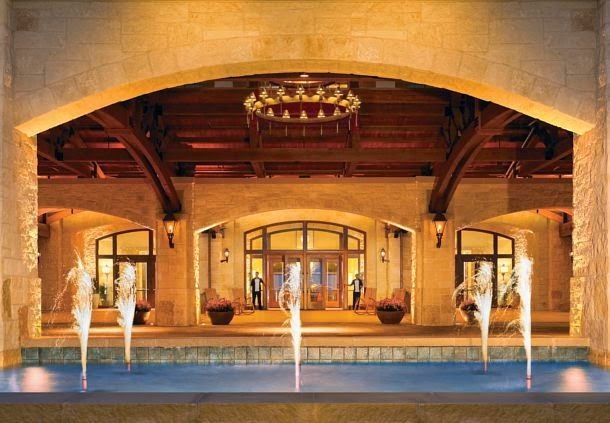 The JW Marriott Hill Country is located just north of San Antonio, on the edge of the picturesque Hill Country. The hotel property is gorgeous, the grounds are lush and green, and the staff really goes out of their way to be friendly and helpful. A stay here is like being treated like royalty! 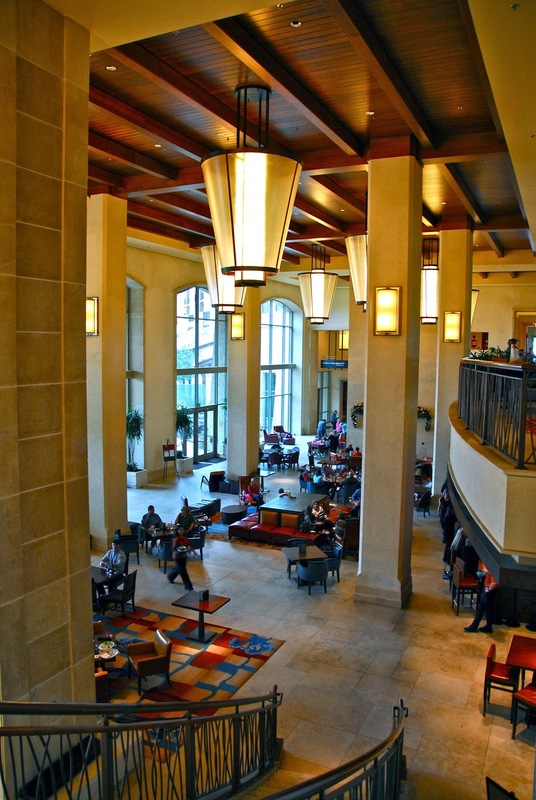 We arrived, quickly checked in, and took a look around the lobby area. The first thing we noticed is that it has a very open feel that's conducive to relaxing and spending time together. We noticed lots of families, groups of friends, and couples enjoying the open concept and natural light while enjoying cocktails and snacks...or perhaps reading a good book. There was even a kid-friendly art project going on in one section of the large two-story gathering area! Whether you want to hang out and relax for a romantic getaway for two...or take part in tons of family activities...JW Marriott has got you covered! The resort features the 36-hole TPC San Antonio golf course, both children's and adult-only pool areas, a bike and nature trail, tennis courts, and the River Bluff Experience. This fun area offers a lazy river, water slides, and pool! If activity isn't on your agenda, the resort's Lantana Spa offers a full menu of luxurious, spa treatments. There are also seven bars and eateries on premises, including a Starbucks and a well-stocked gift shop that offers a wide variety of snacks. With all of these amenities, there's really no need to leave the property during your stay! I haven't even mentioned how fabulous the rooms are! We stayed in a spacious suite that featured a lovely bedroom, two bathrooms, a spacious living/dining area, and a huge wraparound balcony that offered gorgeous views of the grounds. We loved having lots of room to move around in our home-away-from-home. This spacious suite provides enough space for entertaining...or for fitting a family of four. We loved the soothing tones of the decor, and the open feel and natural light. I'm not sure what I enjoyed more -- the fireplace in the living/dining area, the large soaking tub in the bathroom...or the wine, cheese and fruit welcome goodies the management had waiting for us in the dining room area! The room also featured free WiFi, in-room coffee and tea, and spa toiletries. After a walking tour of the expansive property and bit of relaxing in our room, it was time to get ready for a fabulous dinner at La Hacienda. The restaurant was voted Best Outdoor Dining by San Antonio Express-News readers, and it's located a convenient 10-minute drive from the Marriott. We arrived and were warmly greeted by owner Diana Barrios-Trevino. She was a fabulous hostess, dining with us and explaining the history behind their restaurants, as well as the background of each dish served. La Hacienda is a sister property of legendary San Antonio restaurant Los Barrios, which was founded by her late mother Viola in 1979. 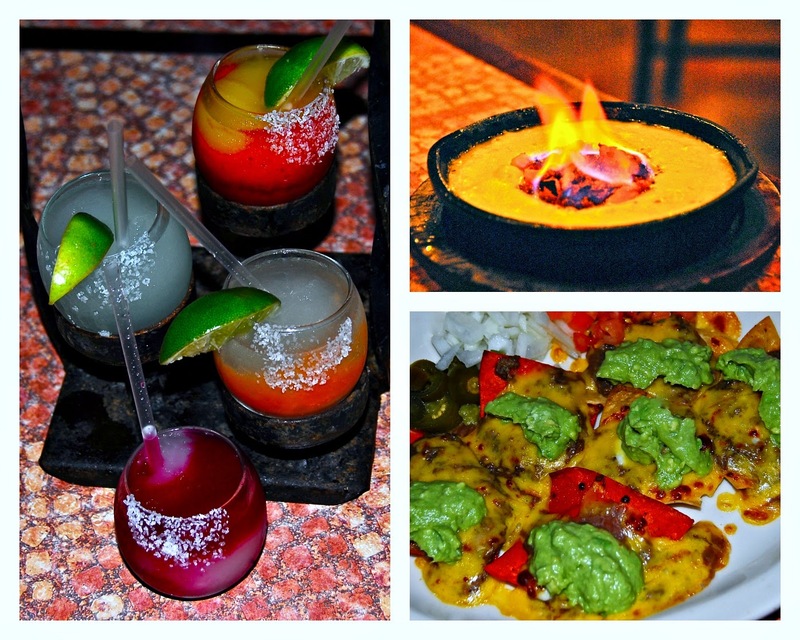 Diana hand-selected some of her family's signature dishes, along with some tasty margaritas! We started out our dinner with a mini margarita sampler, Nachos 'a la Butler', and Queso Flameado. The margaritas we sampled included Traditional, Mango-Strawberry, Guava, and Prickly Pear. All were fantastic, but I was especially partial to the Mango Strawberry's tropical flavor! The nachos are named after long-time regular Los Barrios customer...and are topped with beans, picadillo beef, cheese, and guacamole. They're served with onion, tomato, and jalapenos on the side. The gooey, delicious queso is dramatically flamed and served tableside. Our meal was definitely off to a great start! Next up was a selection of flavorful dishes. 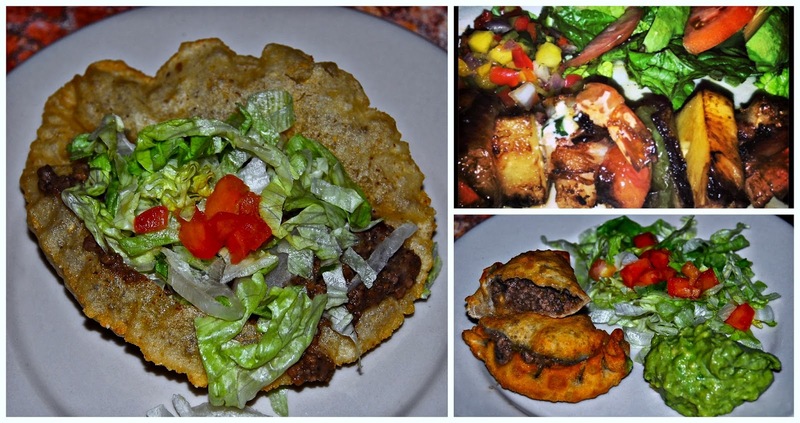 We sampled a Famous "SA" Puffy Taco, Empanada de Carne, and Camarones Tropicales. Puffy tacos are a San Antonio tradition, and these are some of the best! The masa is crispy on the outside, with a soft bite...and the meat is perfectly seasoned. The Barrios family definitely knows how to make a serious puffy taco...Diana took part in a Puffy Taco Throwdown with Bobby Flay on Food Network...and she won! The empanada was deep fried to a crispy brown and filled with a mixture of beef and olives. Topped with guacamole, it was flavorful and savory. The grilled Camarones Tropicales featured shrimp filled with serrano-flavored cream cheese and wrapped in bacon. The shrimp are skewered with onion, bell pepper, and pineapple and grilled. They were smoky, spicy...and a little sweet from the pineapple. Downright addictive! We were getting full, but we still had a couple more dishes to try! We enjoyed lively conversation with Diana while we sampled the Beef and Chicken Fajitas...and a Guava-Cream Cheese Empanada for dessert. The fajitas were just the way we like them: juicy, smoky and tender! The dessert was the perfect not-too-sweet end to the meal. The tart guava and rich cream cheese worked really nicely together, and the sprinkle of powdered sugar on top provided the perfect touch of sweetness. With that, we bid our farewell to our fabulous hostess and headed back to our spacious suite at the Marriott. After enjoying a relaxing soak in the deep bathtub in the suite's master bath, I immediately fell into the pillow-soft mattress and slept like a baby! The next morning, we woke up to gorgeous views of the resort grounds from our balcony. We puttered around until it was time for our brunch reservation at 18 Oaks. 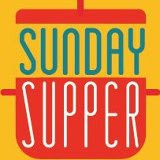 Each Sunday, they offer a fantastic buffet that includes a wide variety of sweet and savory dishes...and mimosas too. We started out with a mimosa while we decided on our game plan to maximize our brunch experience. There was so much to choose from! We started out with the carving station. This area featured roast beef, ham, and pork. The meats were expertly carved to order. 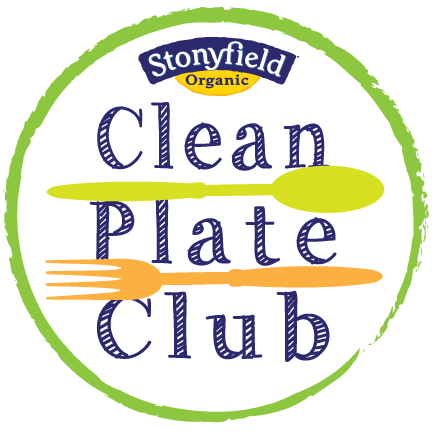 We also dished up plates from the wide assortment of hot and cold brunch items. This included fresh fruit and cheese, egg dishes, cheese grits, and breakfast meats. It was all expertly prepared and frequently replenished to ensure freshness. We loved how 18 Oaks laid out the buffet, allowing guests plenty of room to select items without the lines stacking up. 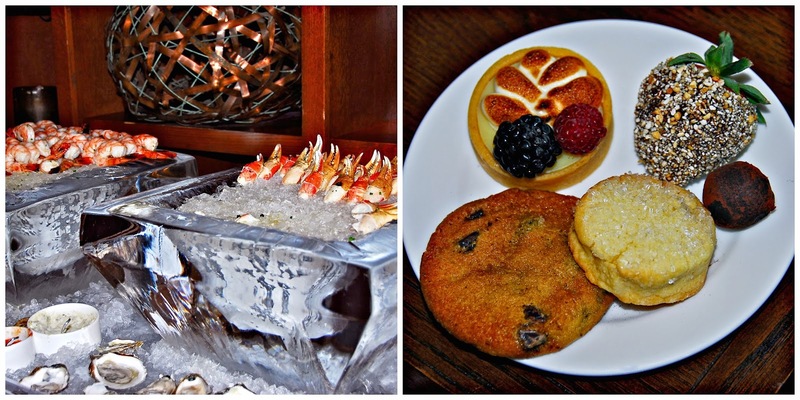 Next up, we hit the impressive chilled seafood display and the large dessert display. 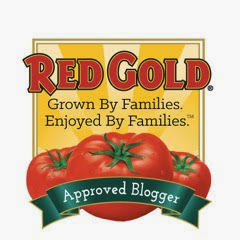 We were very impressed with the quality of the food offered. The shrimp and crab claws were huge and so sweet, and they even offered raw oysters for guests who enjoy them. I especially loved that they peeled the jumbo shrimp and cracked the crab claws, making it easier for guests to eat them. The dessert selections were quite impressive -- everything from chocolate-dipped berries to cookies and other pastries. We loved that most of the offerings were small in size, which allowed us to sample several items without getting too full! The dessert display area of the buffet was displayed in a very eye-catching manner. The hardest part was deciding which items to try! We wrapped up our brunch and headed back to our room to get ready for checkout. Before we left to head home, we stopped by the High Velocity Sports Bar to have a soda and check out the atmosphere. This is one fabulous place to watch sports -- just look at all of the wraparound TV screens they have on the walls! Several games can be shown at once, and they offer a wide range of drinks and a menu of game-watching food. Our server told us that High Velocity isn't just for Marriott guests...anyone in the area can stop in to watch a game and enjoy some refreshments! It's one of the best sports bars that I've seen in San Antonio, and we can't wait to go back next football season to catch a Texans game or two!! With that, it was time for us to head back home to Maggie and Lucy...before their food bowl ran empty! 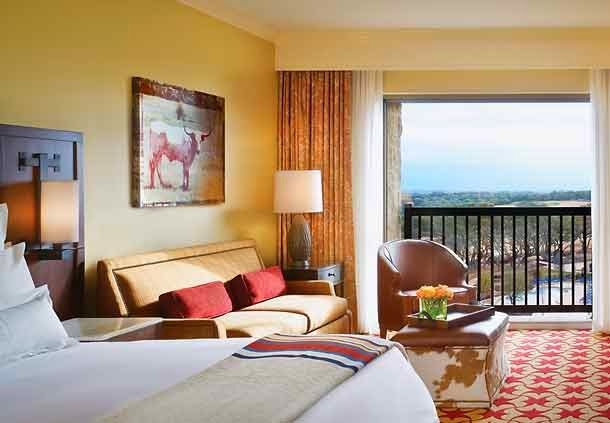 Michael and I agreed that JW Marriott Hill Country Resort is a fabulous property that we would gladly return to whenever we need a quick weekend getaway. 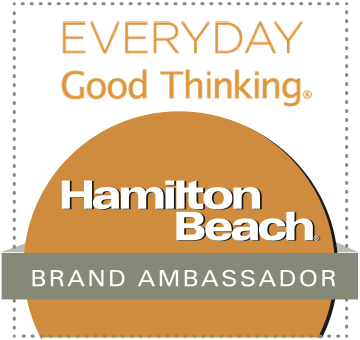 Disclosure: JW Marriott hosted our stay, including brunch at 18 Oaks, to facilitate this feature. Our dinner was also provided by La Hacienda de los Barrios. Unless otherwise disclosed, all photographs are copyrighted by Michael K. Garcia. They may not be copied or otherwise used without prior permission.